Byerly's had their Boo Blast today. It was a lot of fun. 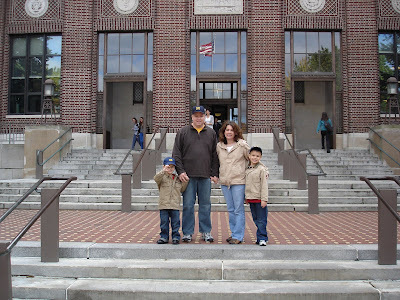 Here is our picture. You'll note that Cameron decided to go as the NASCAR points leader Jimmie Johnson rather than a Jedi. He's saving that for Friday. I have made a lot of projects that relate to fall lately in school. Here is a bouquet of all flowers. And finally, here is the lifecycle of a pumpkin. This weekend, we had to empty all of our pots to get ready for winter. Here is my Forget Me Not, that was really a marigold, that we planted last spring in school. 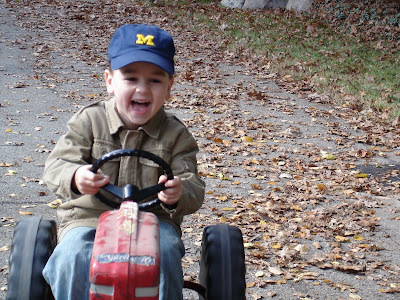 On our last full day in Michigan, we just hung out around Grandma and Grandpa's house. 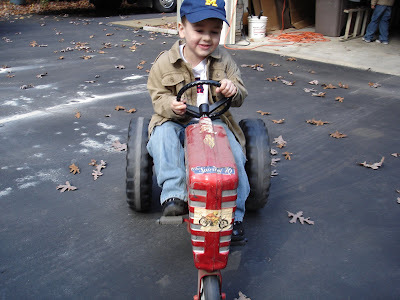 Grandpa got Daddy's old toys down from the attic. 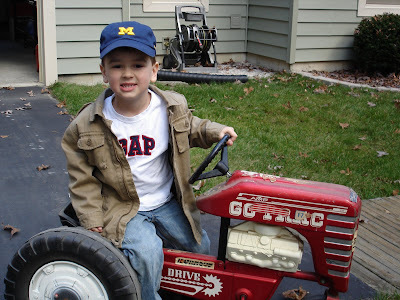 Cameron rode the tractor everywhere. 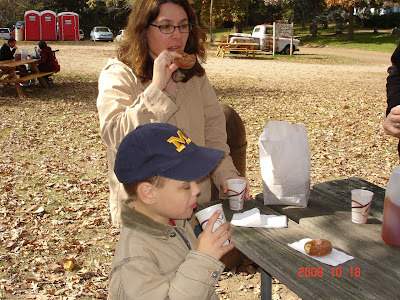 After a while, we went to Diehl's cider mill and had some good, freshly pressed, unpasteurized cider and some cinnamon sugar donuts fresh from the fryer. Delicious. 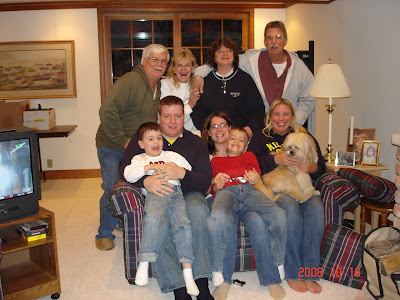 After visiting with some of Daddy's friends, we had a nice dinner and took this family picture. This morning, we got up super early and flew home on an airplane. 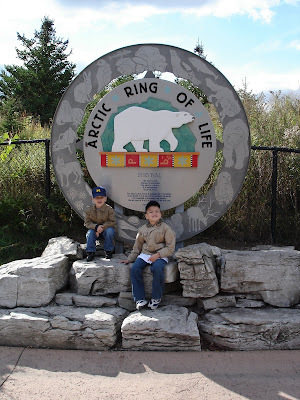 On our second day in Michigan, we went to the Detroit Zoo. 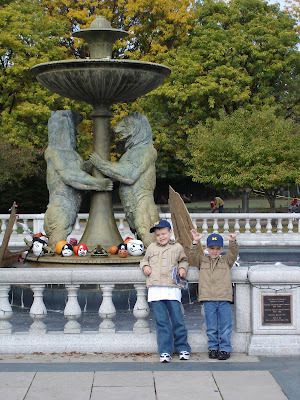 Here we are in front of the Rackham Fountain. 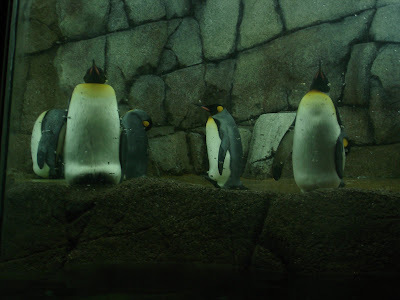 We also went to see the penguins, which was one of our Daddy's favorites growing up. 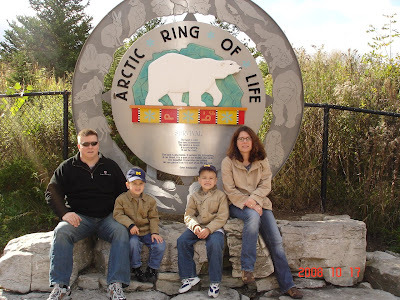 Then we made our way to the Arctic Ring of Life exhibit, which was awesome. 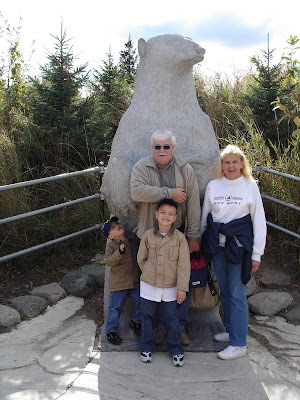 They had a big polar bear statue right near the entrance. 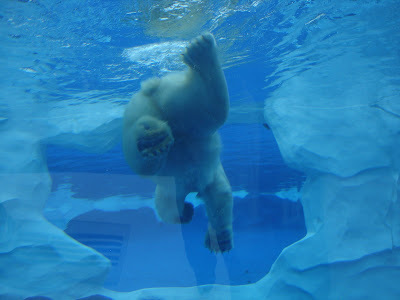 They also had a tunnel that you could walk through underwater and see the seals and polar bears swim over you. 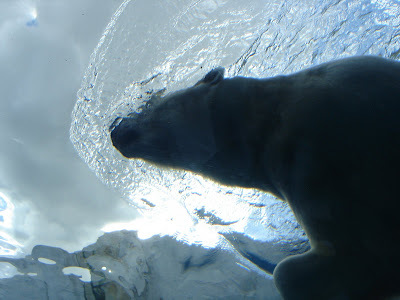 We also got a good glimpse of the polar bears from our zoo, the Como Park zoo. Here is one of them. We think it is Neil. 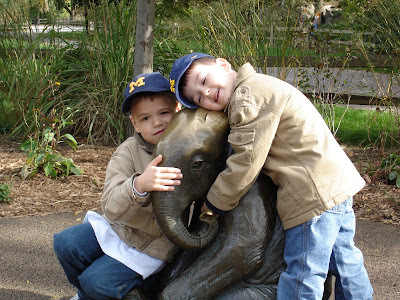 We also passed this cute elephant statue and took a picture. The last thing we did was to go into the butterfly house and walk around. 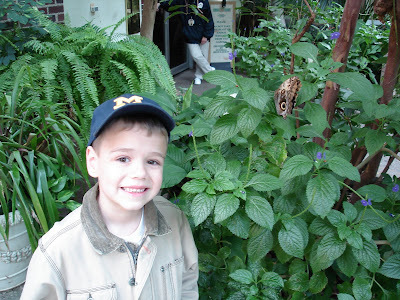 Here is Ben next to a really big butterfly. 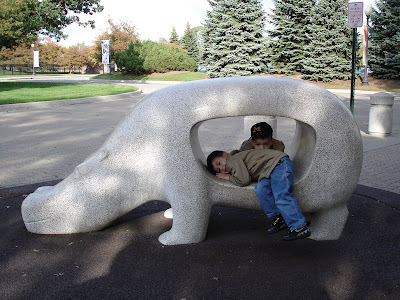 PS: If you ever shopped at Oakland Mall growing up, like our Daddy did, you might remember this hippo used to be outside of Hudson's. 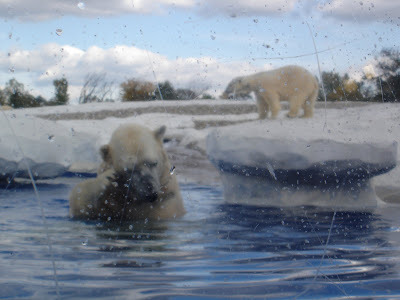 It's not here at the zoo! 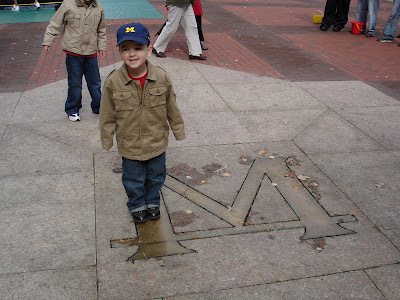 Today was our first full day of visiting Michigan for MEA weekend. 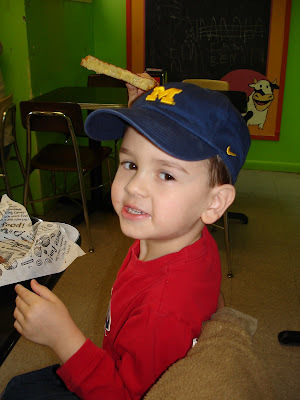 Today, we went to Ann Arbor to see where Daddy went to college. 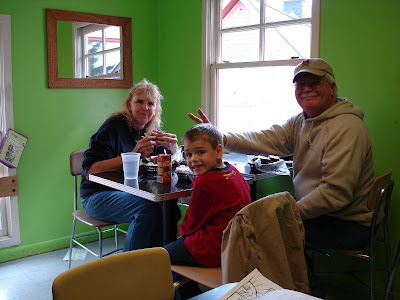 It was about lunch time that we got there, so we went to Zingerman's for lunch. It is a famous deli. 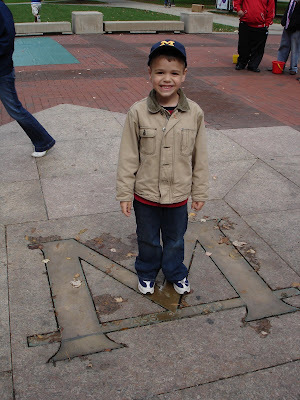 Then, we went to campus and visited something called "The Diag." 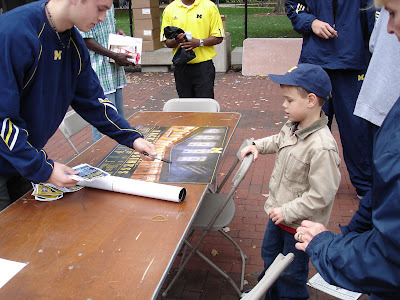 On The Diag, we met the Michigan basketball team and they autographed posters for us. 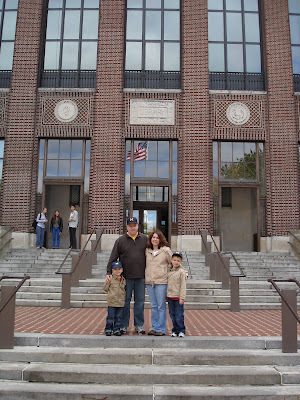 We had this nice family photo in front of the graduate library. 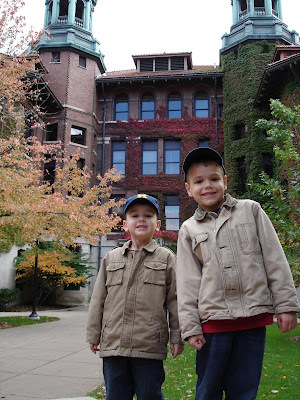 And then Daddy took this picture of us in front of West Engineering. It is now called "West Hall." 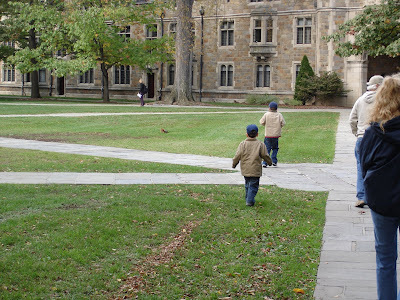 We got a bunch of souvenirs and then we ran through the law quad. 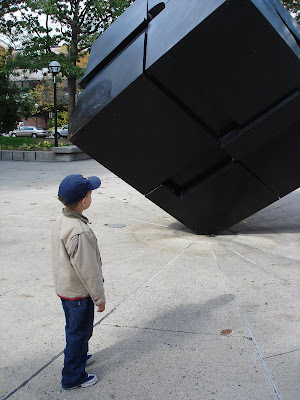 We also went over by the Union and made the cube spin. 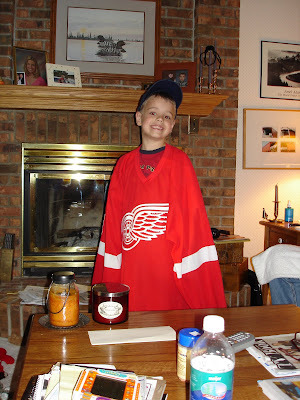 We were pretty wiped out by then, so we went to Aunt Mee and Uncle Dale's house, where Ben tried on a life size Terry Sawchuck jersey, which way very big. Last night we tried on our Halloween costumes. Here is a sneak peak. We studies apples in school. No, not the computers, apples! Here is my apple mobile. We went to Algona for the band day parade. It was the 60th one. We didn't eat the walking tacos. They just didn't sound good. Daddy and Hayden were pretty low key until the parade started. When the parade started, we were all pretty excited. The bands were pretty good, but gas prices were getting even better. By the end, we were pretty tired. 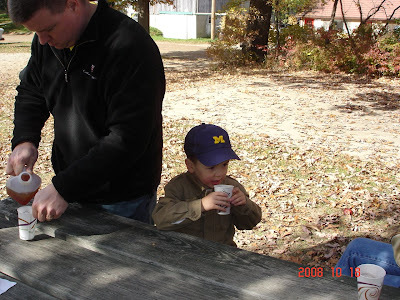 But that didn't keep us from going to the pumpkin patch.